I was first introduced to kombucha by my high school English teacher, and once I tasted that sweet yet tangy deliciousness, I was instantly hooked. My thirst for kombucha, refreshing and healthy, was limited by its cost, about $4 a bottle. Just walking past the beverage cooler often made my wallet hurt. Thus, I stuck to consuming this fermented favorite in moderation. As delicious and refreshing as kombucha is, paying $4 a bottle seemed crazy expensive, especially since it’s tea, sugar, water and bacteria. 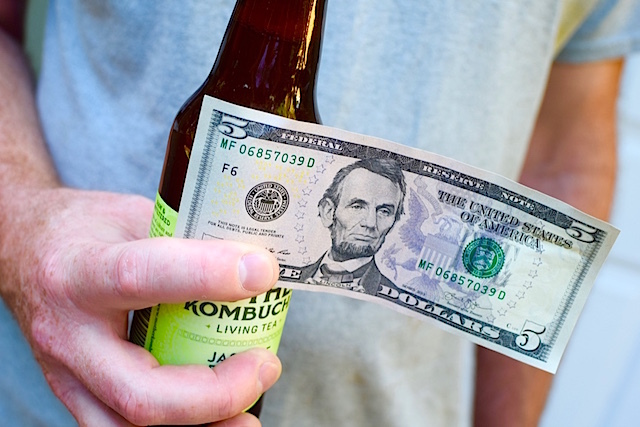 There’s a reason Whole Foods is lovingly called Whole Paycheck, and kombucha is exhibit A. Thus I began the journey to saving money by brewing my own kombucha. What Do You Need to Make Your Own Kombucha? Gathering materials is pretty simple. You likely have most of the ingredients and equipment already in your kitchen. I know I did. Water? Check. Tea? Yep. 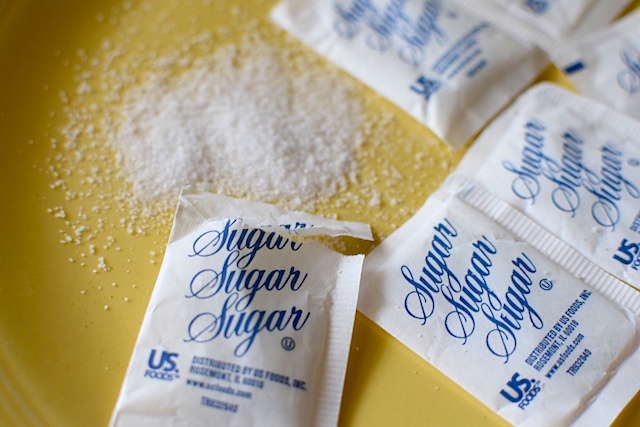 Sugar? Got that, too. Scoby (also dubbed a kombucha mother; it’s a colony of bacteria and yeast that looks like a pancake)? OK, so I didn’t have that, but you can easily buy one, get one from a friend or even make your own from scratch or the remnants of some store-bought kombucha (unflavored works best). Sites like Craigslist and local DIY communities are also great places to look for a scoby. 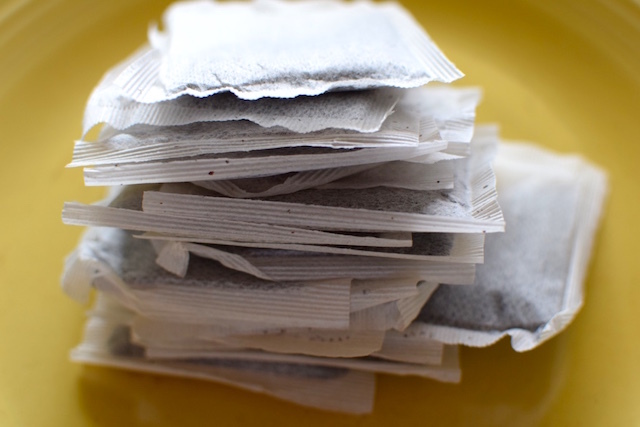 As for equipment, you’ll need a quart jar, coffee filters and a rubber band. Thanks to my voracious coffee habit (I prefer French press, but there’s the Mr. Coffee for rushed mornings), a salvaged Classico spaghetti sauce jar and several sturdy rubber bands from broccoli I bought at the grocery store, I was in business. What If You Don’t Have Any of That Stuff Already? Let’s take a step back though, as not everyone will be as fortunate to have most of the necessities on hand. If you have to buy all of the ingredients, there’s a $6-$20 startup cost depending on how fancy you want to get with your sugar, tea, jars, etc. That small investment will get you through at least the first 10 quart batches, probably more, which works out to $1 or less per 16 ounces, or about 6.3 cents per ounce. A 12-pack of 16-ounce bottles can cost you up to $170, though even the $50-80 range isn’t cheap. Sure, it’s healthier than soda, but that’s pretty steep. Even scaling down to 8-ounce bottles, a 12-24 pack runs about $30-45. Even if we assume you have to buy all your supplies and get a mere 10 quarts from them, that’s a 50-75% minimum savings when compared to the store-bought variety. Kombucha, I discovered, isn’t as difficult to produce as it may seem. The initial activation took about 15-30 minutes. Check out this recipe or video to get started. The first culturing session takes roughly 30 days, and it’s pretty hands off. Ideally, store your jar at room temperature and out of direct sunlight. My tea spent a month on the top shelf of my pantry nestled between a bottle of Kahlua and a fifth of Jose Cuervo. Hey, you can’t survive on kombucha alone. My kitchen curiosity was piqued. What other delights awaited the empty Ball jars decoratively displayed above my stove? Enter water kefir. No, that wasn’t a typo. You’re probably familiar with milk kefir from wandering the grocery store aisles, and water kefir (compare to a beverage like La Croix or Zevia) is a reasonable facsimile. It’s essentially liquid fermented by bacteria and yeast grains. As the name suggests, water kefir ferments, well, water — sugar water, to be exact. If you think kombucha is simple, water kefir is even easier. Just brew up a batch of sugar water, let it cool and plunk in a few gelatinous water kefir grains. A much shorter fermentation time later — about four days — you’ve got your first batch ready for flavoring and bottling. Unfortunately, harvesting water kefir grains from scratch isn’t quite as easy as with kombucha, but it’s quite affordable, with some grains costing as little as $10. A quick Amazon search yields loads of results. So what do you actually use water kefir for? It’s perfect as a base for drinks and foods, ranging from homemade “sodas” to desserts, and even toppings like salad dressing. Add some lemon juice, and you’ve got lemonade. 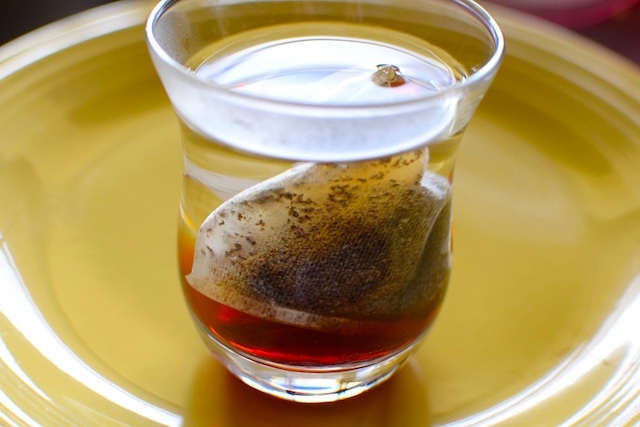 A few teaspoons of vanilla extract and you’ve transformed that water kefir into cream soda. One of my favorite concoctions? The Shamrock Water Kefir Shake, which is a delightful combination of avocado, kale, mint extract, honey, coconut milk (I substitute almond milk), ice cubes and water kefir. Sure, the mixture may sound odd, but it’s amazing. Pro-tip: be heavy-handed with the mint extract and honey to offset the garden undertones from the kale. Like a kombucha scoby, water kefir grains can be reused in subsequent batches, and they actually multiply. I inherited a batch from a friend who needed to discard excess grains, so mine were free — ask around in case anyone you know has extras! Could Kombucha and Water Kefir Help You Save Money? Both drinks are packed with probiotics. Once I began consuming probiotic-loaded drinks on a regular basis, let’s just say I found my three-a-day probiotic and digestive enzyme regimen unnecessary. If you’re a fellow probiotic fan, you know all too well just how pricy a bottle can be, and these fermented beverages helped alleviate the need to purchase those dietary supplements. I now had a near-limitless supply, plus the satisfaction of knowing I made it. Like anything living — and yes, to quote Dr. Frankenstein, “it’s alive” — booch and kefir need caring for. You have to feed them, or brew a new batch at regular intervals. For kombucha, this means about a week to a month, but with water kefir, it’s every day or two. With water kefir especially, if you’re not quickly drinking what you’ve amassed, you may run out of bottles. If you’re getting overwhelmed, check out this guide to taking a break. Still, it’s a small price to pay for the probiotic and savings benefits. At least you don’t have to walk your kefir when it’s freezing or raining outside. 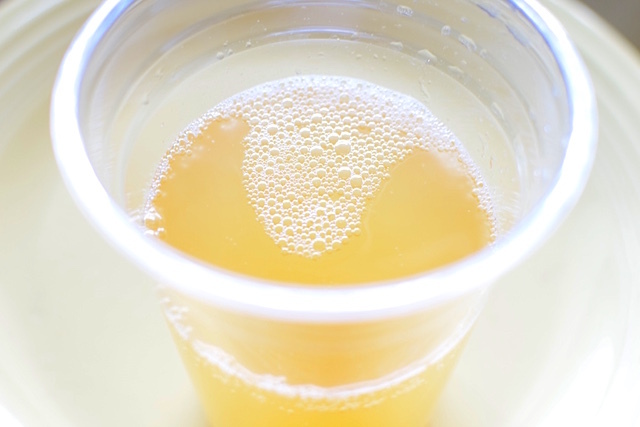 Your Turn: Have you tried brewing your own kombucha or water kefir? How did it go, and did it help you save money? 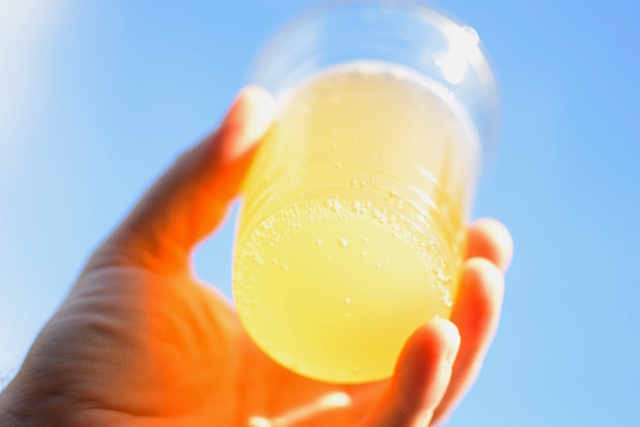 Disclosure: A (kombucha) toast to savings! Thanks for allowing us to place affiliate links in this post. Moe Long is a Durham Movies Examiner, and Contributing Writer for AXS, Cliqist, and Blasting News. When he’s not writing, you can find him drinking way too much coffee, listening to vinyl and watching “The X-Files” reruns.